A photograph of Jackie Kennedy captured just hours after the assassination of JFK will go on sale at auction in New York next month. Described by auctioneers as one of the most famous and sombre photos of the 20th century, the ?tragic image? shows Vice President Lyndon B Johnson raising his hand to be sworn in as the 36th President of the USA. ?Alongside him stands a shocked and grieving Jackie Kennedy in the blood-stained dress she had worn as she cradled her dying husband in her arms,? said a spokesman for Bonhams which is set to auction the photo on 9 December. 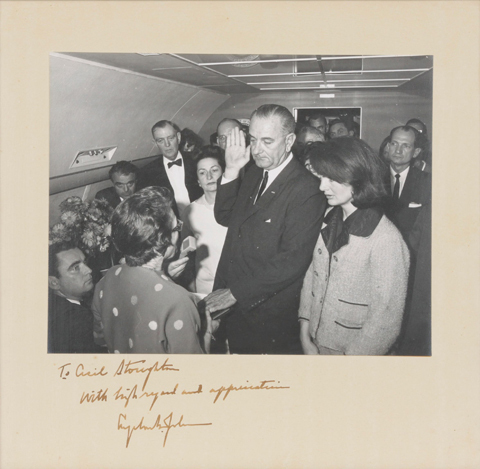 The picture, which is signed by President Johnson, was taken by Chief White House Photographer Cecil Stoughton on board Air Force One, the presidential plane. 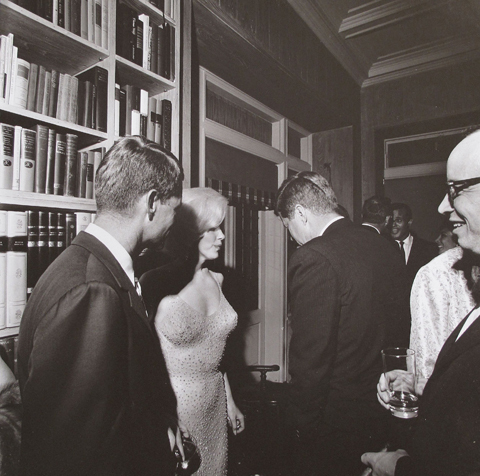 Also up for grabs will be a photograph of Marilyn Monroe with John Kennedy and his brother Robert, taken at a Democratic party fundraiser on 19 May 1962. Discovered in an envelope marked ?Sensitive Material? it was captured shortly after Monroe sung ?Happy Birthday Mr President? at Madison Square Gardens. The cache of photos charting the Kennedy presidential years is expected to raise more than $200,000.